Be the first to share your favorite memory, photo or story of Jeanie. This memorial page is dedicated for family, friends and future generations to celebrate the life of their loved one. Jeanie Brovold passed away on November 20, 2018, after a 9 year battle with cancer. She was at home surrounded by the love of her family, close friends, and her cats. Care Wisconsin and Hospice was a great support for Jeanie, the family, and friends. A special heartfelt thank you to her dear friends and caregivers, Paula Luer and Jeanne Flaskrud, who spent most of their time taking care of Jeanie during her final days. Jeanie was born September 1, 1955 in Milwaukee, WI. Soon afterwards she was adopted by Dale and Ruth Myers. She joined big brother, Mike, and eventually gained a little sister, Jacki. Her family meant the world to her. 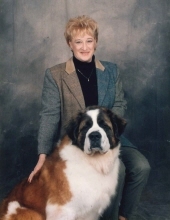 Jeanie grew up loving the farm life and carried her love of plants, animals, and hard work with her for her entire life. She married Jerry Brovold on April 6, 1996. They loved traveling to spend time in Duluth. Jeanie loved her work for many years at Marshfield Clinic and made great long friendships, enjoying their coffee club times together. She received great help and support from Dr. Halkova and the ladies from Marshfield Clinic. Jeanie will be missed by many family members, friends, and co-workers. She was preceded in death by her husband, Jerry, who passed in August 2018; her beloved mother, Ruth; 4 grandparents, Ben and Lillian Rudy, and Clarence and Goldie Myers; 4 aunts, Shirley Myers, Bernice (Tootie) Myren, Marion Rudy, and Betty Rudy; and 2 uncles, Lloyd Myers and Clifford Rudy. Survivors include her father, Dale Myers; brother Mike (Diane) Myers; sister, Jacki (Doug) Blaha; nephew Travis (Tina) Myers; mother-in-law Arlene Brovold; two sisters-in-law, Nila and Susie; two uncles, Richard Myren and Robert Rudy; many cousins, and her many friends. Visitation will be held December 1, 2018 from 10:00 A.M. until the time of service at Pleasant Valley United Methodist Church, S12166 Hillview Rd, Eleva, WI 54738. The service will begin at 11:00 A.M. In lieu of flowers, donations in memory of Jeanie will be greatly appreciated. Stokes, Prock and Mundt Funeral Chapel, Altoona is assisting the family with arrangements. Online condolences may be shared at www.stokesprockandmundt.com. "Email Address" would like to share the life celebration of Jeanie Brovold. Click on the "link" to go to share a favorite memory or leave a condolence message for the family.